DB2® 10 for z/OS can reduce the total DB2 CPU demand from 5-20%, compared to DB2 9, when you take advantage of all the enhancements. Many CPU reductions are built in directly to DB2, requiring no application changes. Some enhancements are implemented through normal DB2 activities through rebinding, restructuring database definitions, improving applications, and utility processing. The CPU demand reduction features have the potential to provide significant total cost of ownership savings based on the application mix and transaction types. Improvements in optimization reduce costs by processing SQL automatically with more efficient data access paths. Improvements through a range-list index scan access method, list prefetch for IN-list, more parallelism for select and index insert processing, better work file usage, better record identifier (RID) pool overflow management, improved sequential detection, faster log I/O, access path certainty evaluation for static SQL, and improved distributed data facility (DDF) transaction flow all provide more efficiency without changes to applications. These enhancements can reduce total CPU enterprise costs because of improved efficiency in the DB2 10 for z/OS. DB2 10 includes numerous performance enhancements for Large Objects (LOBs) that save disk space for small LOBs and that provide dramatically better performance for LOB retrieval, inserts, load, and import/export using DB2 utilities. DB210 can also more effectively REORG partitions that contain LOBs. 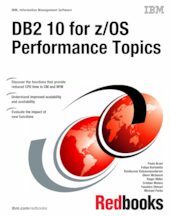 This IBM Redbooks® publication® provides an overview of the performance impact of DB2 10 for z/OS discussing the overall performance and possible impacts when moving from version to version. We include performance measurements that were made in the laboratory and provide some estimates. Keep in mind that your results are likely to vary, as the conditions and work will differ. In this book, we assume that you are somewhat familiar with DB2 10 for z/OS. See DB2 10 for z/OS Technical Overview, SG24-7892-00, for an introduction to the new functions.